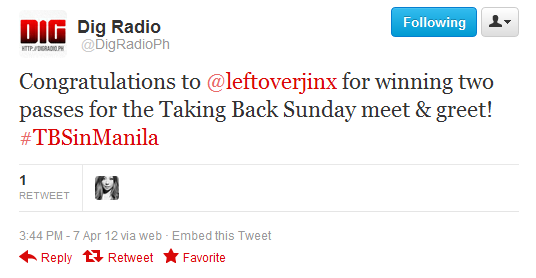 I won the meet and greet passes for Taking Back Sunday's concert. How do I even begin this entry? I have nothing clever to say. I've got no punchlines. No witty remarks. Everything is just so freaking surreal right now. I've given up all hope in scoring those meet and greet passes after Taking Back Sunday's concert here. I was telling my friend that I never really had luck on raffles or draws or anything like that. In my entire existence, I was only picked one time: 2009 Christmas Party and I won a rice cooker. And then the most unexpected thing in the world happened: I actually won a pair of that most desired, most sought after meet and greet passes. I was at Burger King with my friend, Natz talking about how I wanted a lemon meringue but it was currently out of stock, and I was also tweeting with Zena. Contrary to my previous post, I didn't do any of those things. But maybe, it was happening all at once inside my head. I just stopped and stared at my phone, wasn't able to utter a single word for around 20 seconds, held Natz' hand and asked her to feel how my heart pounded. Making her face be filled with worry and ask what is the problem and all I could reply was my most bashful grin. You see, we don't really have much in common when it comes to music but we are best friends in the whole wide universe! I explained to her everything and she began congratulating me and I was still floating in the clouds, still in a trance, imagination on full speed and all I can say was "Yeeeyyyyyy!" Dig Radio told me to contact Niles Chong for the details on how I could claim my meet and greet passes. I guess being persistent pays off! Hahaha. I couldn't keep my mouth shut about the concert and somehow, I was lucky enough to be noticed. And that last sentence (on Niles Chong's last tweet) is just amazing. I know there are a whole lot of other people that are bigger fans than me-- those who knows most lyrics to songs, more updated than anybody else, those who literally follow the band around. I'm just this Asian girl who has been a fan of the band since 2004 and since she can remember, it was part of her bucket list to meet the band or Adam Lazzara at least. And someone saying to me that I deserve this opportunity really had an impact. I just had to blog about this so I could immortalize the moment and maybe, 5 to 10 years from now, when I read this blog, I will get to relive at least in my memory that pure joy I felt when I finally was given an opportunity to fulfill a dream. 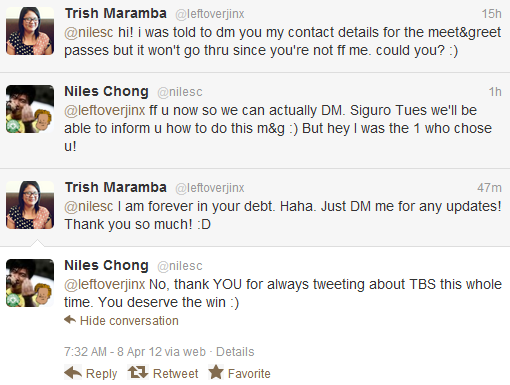 Before I get too cheesy, let me just thank again Dig Radio and Niles Chong for this. And again, Kerplunk! Studios and Audio Mustachio for bringing them here. Now, my life is complete (so far)! Hehehe.